I love the necklace, thank you! I can see what you mean about the colors being brighter than those on the bracelet, but it's close enough. Her work is really beautiful. The necklace is very wearable, not too fancy. And as usual, the package came beautifully wrapped, which made it so much fun to open! Christmas in March! Blessings on you, Karen, and on John Charlton (Charlton Glassworks) for your role in helping to make my beloved Sedona Ikebana whole again! I truly appreciate that John is forwarding a new sleeve and wick. I experience great delight every time I light the wick and/or refill the oil well. It is a special piece of art in our home, admired by many. Thanks to John for his generosity and thanks to you, Karen, for facilitation and expediting this! We love the (Leonie Lacouette) wall clock! Thank you! Thank you so much for your support and thoughtfulness. I look forward to the earrings, as I have the matching Bunny + Amethyst pendant as well as many cherished, impressive items made by this designer. I enjoy wellmade statement pieces by Amy Khan Russell. I am constantly showered with comments when I wear them. I make a point to wear jewelry every day. I wear it and enjoy it. "We ordered a contemporary triptych stainless steel and copper clock from Rendezvous Gallery. We couldn't be more pleased with the service we received. Karen was extremely accommodating, and served as an invaluable communicator between us and the artist. Would highly recommend Rendezvous Gallery - they are a pleasure with whom to work, and have great taste in art to boot! The contemporary clock by Leonie Lacouette is a gorgeous piece - vibrant colors combined with stainless steel, and a clock with a slow (and exceedingly quiet) pendulum. A functional piece of art that will add considerable beauty to any contemporary or modern home." I just spent the last two hours looking at your new website. It is absolutely beautiful! Browsing the website is like having a virtual tour of your gallery. I love it! The collection is the most exquisite art work of its kind. My husband and I were looking all over in Murano and Venice but didn't see any glass art as unique as Victor Chiarizia's. My overall impression is pure beautiful design, lasting art effect, and a very easy to use website. The custom Amy Kahn Russell chalcedony earrings (to replace the pair I lost) are perfect! Although a bit darker than my original pair, they are a great match for the necklace that I will wear them with. Thank you for doing this special order for me. "The necklace arrived today safe and sound and is just beautiful! I may have said it already, but you have the very best of Amy Kahn Russell. She has an amazing repertoire of styles - everything from big and bold to delicate and dainty. I was debating between this and the agate geode with the metal leaves. Interestingly, it sold a few hours later! There must be something to the collective unconscious!" "My Key Lime bracelet (by Marco Polo Designs) arrived on Monday. It is so lovely, springy and shiny. I love it!!! Now we just need some spring weather! Also, Georgi received her Crocodile bracelet on Monday, just in time for her birthday. She called yesterday to say she was thrilled with it! I really appreciate how hard you worked for us both to order the Marco Polo items. I'm keeping your website on my "favorites" list for future reference. Best of luck with all of your artists and their spring merchandise." I really love that frog, what a treasure it is!!!!!!! I feel like a very lucky woman to have something that beautiful in my collection. I mostly wear Native American pieces and it goes amazingly well with them, the babat (Tohono O'dam for frog) is an important symbol for many different people and the beautiful frog in that ring is absolutely stunning. I just looked at your link to the new additions to Amy's trunk show - WOW, do I ever need to win the lottery. Her pieces are stunning. I am a huge fan of her work and really love the pieces I have from her. Her work has so much heart and soul, such a lovely lady!" "I received the (Amy Kahn Russell) bracelet. Wow - it is even more beautiful than I imagined and fits perfectly. Thanks again for your help!" "You ROCK!!! Thank you so much for tracking down the artist (Charlton Glassworks) for me so I can get the parts and use my awesome lamp again!!! Many thanks." "Thank you so much! The (Leonie Lacouette) clock is amazing, just love it." "Thank you so much for your prompt follow-up and action. I am sure I will be back to do business and it was a pleasure dealing with you, Karen." "I just ran outside and grabbed the UPS guy! I LOVE the (Amy Kahn Russell) earrings! They are really pretty. I love the little dangle!" "I received my beautiful Amy Kahn Russell pin on Friday afternoon. It was such a happy surprise at the end of a very hard and emotionally draining week. I can't tell you what a welcome lift it gave me. Thank you so much for the fast shipping!" "I just wanted to let you know I received the amazingly gorgeous Amy Kahn Russell exotic bird bracelet yesterday, so beautiful and stunning! My Mom is a long time lover of exotic birds and she is going to be so thrilled with her Christmas present! Thanks so much for having such a beautiful gallery. I hope to make a purchase from you in the near future!" "Thank you so much!!! That should impress my Mother-in-law!!!! You're just great and I look forward to doing business with you again." "Hello. I recieved the clock. She (it) is magnificent. You will thank Leonie Lacouette for me. I am delighted with my purchase. It is a pity a gallerie like yours does not exist in Europe or in France." "I purchased the Amy Kahn Russell square amethyst drusy earrings from you. Love them." "I wanted to let you know that I received the beautiful Jurado mirror in perfect condition. Thank you again and Happy New Year!" "I have no problem in you adding my comments to the gallery customer page, as we have been and are very impressed with the service, help and support you gave us in obtaining a replacement lid for our (Charlton Glassworks) oil lamp. Once again thank you very much for everything you have done for us." "I have forwarded your website to my friends. The beautiful design and inspirational artwork/jewelry will attract people with good taste." "Just a very short note to let you know that the (Jack Brumbaugh) painting arrived safely. It is absolutely stunning. I am delighted with it and delivered it to a local picture framer on Saturday. I'll keep watching your web site from time to time. Thanks again for your excellent service. I am happy to be added to your list of satisfied customers as I read their comments before making my order with you." "Thanks so much for your follow-up and for making the purchase so easy. Your efforts are much appreciated. Thanks again." "Just one hour ago I got the order. Thank you so much! They're so beautiful!!" "I received my black onyx earrings yesterday. They are gorgeous. Thanks so much!" "By the way, we love, love, love the (Leonie Lacouette) clock and have gotten numerous comments on it." "I got home early today and there was the box from you already! I love the color of the earrings and although they don't go with what I had originally intended, they are the perfect match for another jacket that needed a special piece of jewelry. Thank you again for securing another lovely set of Amy Kahn Russell earrings for me." "I got the (Leonie Lacouette) clock today. I love it! It wasn't quite as big as I pictured, but it is fine. Thank for your all your help." "I received the earrings and they are beautiful! Thanks so much!" "I received the Atlantis Awakening set (Marco Polo Designs) and wore it to work last week. I received a lot of compliments. I've also given your web site information to a couple of friends who will hopefully be ordering from you in the near future." "My order arrived and I am very excited about my purchases. Please keep me on your email list. Great website!" "The necklace arrived today and it's gorgeous! Even prettier than the pictures. A great addition to my Amy Kahn Russell collection. I'll really enjoy wearing this one! Thanks for the great service." "The starfish is lovely! It is the perfect accessory for a black evening outfit when suspended on a silk ribbon. Again, I so appreciate your effort in tracking it down after I had purchased the earrings. It's been a pleasure being a repeat customer." "Your site looks so lovely! The photos are very nice with your other artists. You do great work! We look forward to working with you." "I received the (Amy Kahn Russell) pendant this afternoon and I am wearing it tonight. I really do like it and again thank you so much for remembering me for this piece. Sure you can use my comments. It was very easy working with you and I don't mind sharing this fact with others. Again, thank you." "I fell in love with these (Amy Kahn Russell) designs because of the fact that beautiful, handcrafted clips are rare and hard to find. Thank you for the personal service. I look forward to doing business with you again soon." "I received the (Jay Rotberg) sculpture last week and my wife loved it. Thanks! They are very nice and I can see how tempting it is to start collecting them." "My (Leonie Lacouette) copper wall clock arrived and it's everything I expected and more. I am very pleased. Thank you for offering such exquisite items—these are the things that make a home special! ... Leonie Lacouette's clocks are beautiful and this will be appreciated in it's new home. I look forward to returning to your site to look for a special gift. Thank you." "She loves it! (Mikutowski Woodworking jewelry box) Thanks very much for all your help. As a funny note, on the 23rd, we were in a crafts store in Rhode Island and saw THE SAME BOX (in a different wood and $60 more expensive) and she was very taken by it ... what are the odds of that happening!? Thanks again." "Great web site and very nice selection of art." "I have received the packages. Both pieces look divine. Thank you so much for all the effort you put in to locate the bracelet and also for looking into all the 'customs' side of things." "The (Mikutowski Woodworking) jewelry chest just arrived. It is SO beautiful! I love the rosewood on the outside and it's really nice and roomy! Now I have all my jewelry organized and I feel much better. It was a real splurge for me to buy it, but I'm very happy!" "My (Marylou Ozbolt Storer) jacket arrived and I absolutely love it. It fits great, too. Thank you so much ... Yes, you can add my comments. It was a totally positive experience buying from your gallery on-line. You made it easy for me to buy a jacket I've been looking for for over five years." "Just wanted to let you know that I LOVE my bracelet and that it was definitely worth the wait. Thanks so much for holding it for me until I arrived in Arizona. I will check the web page regularly for continuing trunk shows." "The web site looks GREAT!!! It will be my #1 referral." "Just to let you know, I received the pendant today. It is absolutely gorgeous and I shall be extremely happy showing it off to everyone here! Once again, thanks for all the trouble you went to in sending it to the United Kingdom. You've been an absolute delight to buy from and it is much appreciated." "I received my pins and I think they're even prettier than the photos! The way you package them up is absolutely delightful. Thank you for making this such a positive experience. I'll be back! ... Thank you for the excellent photos of your past turtle pins. Thanks also for shipping my pins so promptly. It sure is easy doing business with you! ... I would be more than happy to have you quote me. I think you will have a number of opportunities to do that in the future." "Your web site is beautiful and very user friendly. Not only is it classy, but it is simple to navigate. You can tell an artist put it together." "The beautiful earrings arrived today. Thank you for sending them so quickly." "The batiked bone earrings came today and I love them! They actually make my face look more angular, which is a good thing in my case. I suspect I'll be wearing them often, if not daily! I do like that look. Thanks again ... The earrings came today. They are stellar—I mean it. The palm nuts are so unsual and the combination with the platinum crystal is unbelievable. My husband says they are gorgeous! I'm going to wear them Sunday night when we celebrate his birthday by going to hear Dr. John! Thank you. I'll be back!!" "I love my scarf! It is a fantastic color match." "I enjoy your web site very much. Thank you!" "The rabbits look wonderful peeping out below a jacket cuff! It is exactly the AKR bracelet that I had hoped you would be able to find for me. As always, it came elegantly boxed and well packed for shipping. Thank you for all of your efforts in finding me such unique animal art jewelry. Your package was here when I arrived home this evening. I couldn't wait to open it and am thrilled with the AKR rabbit pin/pendant. The rabbit carving is just delightful and reminds me of my small black house rabbit, Perri. Thank you for seeking it out for me and shipping it so quickly. I can't wait to wear it! I look forward to seeing your new collection." "I believe I qualify as addicted! Obviously Amy's pieces speak to me. WOW. She is incredible. I'll keep looking at your web site for new stuff." "I love the Eskimo piece, especially since I show an arctic dog ... Samoyeds. This will be a real conversation piece on my lapel when I show. I will keep watching the trunk shows to see if anything comes up that I must have." "Thank you so much for the treasures! I will enjoy them for years. Your selection is amazing and customer service is flawless. You are my favorite online resource and I am happy to be one of your devoted fans." 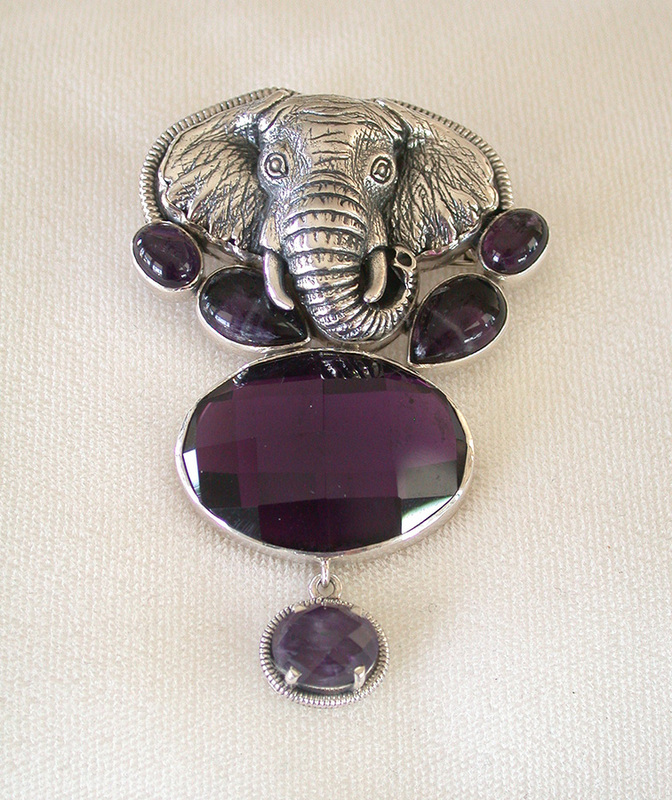 "I am a brand new visitor to your lovely "store " and am ordering a wonderful pin/pendant today from Amy Kahn Russell's trunk show. She is truly one of my favorite artists ... Thanks so much for the wonderful head's up! I found 5 or 6 pieces I must have. There are really some delightful pieces here ... Oh yes, I've worn 3 of the lovely pieces so far. Of course, everyone wants to know about them, where I got them, etc. ... I'm thrilled to have found your wonderful website, Karen, and look forward to more adventures in shopping in the near future!" "The amethyst earrings are absolutely adorable—I love them. Thanks much. I will look at the new trunk show right now! This is more fun than a walk-in store. The drusy earrings are absolutely gorgeous—even prettier than I expected. My husband loves them too! Thanks so much. I saw the earrings, but I can't wear them until Valentine's Day. My husband is giving them to me!" "The peacock is perfect! Thanks so much for tracking it down ... Never too many emails when it is about jewelry! I got the other package. The necklace and the pin are great." "I just wanted to let you know that the earrings and necklace came today. I was surprised at how well they blended together. I plan to keep both items and thank you for your help. I enjoy looking at all of the pretty jewelry. The Amy Kahn Russell pin/pendant and brass clip earrings arrived today and I am quite happy with them. Thank you for packing them so nicely. The wrapping itself was a treat. I am looking forward to viewing the new Amy Kahn Russell trunk show and would appreciate being notified when new things arrive. Thanks again." "This was the best box ever. The big clips were just to die for! The tiger iron and the Chinese turquoise are just more than words can say. And, you know what, although I would never in a million years have picked that bracelet to go with my necklace, it does look great. So, it's a keeper. My jewelry collection will be the envy of all my friends. Keep your eyes open for me, I know you will. Boy, would I love to be there when the (next) box of goodies arrived." "I love so many things on your site. I really appreciate your willingness to accommodate my order. I love the Kristen Carter bracelet! I'm so pleased with it and will certainly make future purchases." "GORGEOUS ... GORGEOUS ... GORGEOUS. All the pieces are absolutely fantastic in all the e-mails. Okay, I haven't decided which cat pieces yet, but I'll take the boulder opal bracelet and horse pin/pendant for starters." "I love the Amy Kahn Russell piece I received today—very pretty! Even better in real life! Thanks for sending it so quickly. I will look forward to hearing from you regarding the amethyst one. You offer exceptional and personable service—not to mention lovely things." "Gifts arrived today with no problem. My daughter or son (?) left them on my dining room table and my wife started to open them, thinking they were perfume she had ordered. When she saw the invoice she realized they were not (yet!) for her and stopped. When I got home she told me. I figured she might as well start wearing them and I couldn't keep them for a month anyway. (I'd have given them long before then.) So I presented them today ... And she loves them all!!!" "Just want to let you know that your package arrived and I am very happy with the earrings. Exactly as pictured. This was my first purchase with Rendezvous Gallery, but it certainly won't be the last. I'd also like to mention that your packaging was so spiffy and I'm happy to have the great pen which I'm already using. Thanks so much." "Thanks for sending the Gallery e-newsletter. It looks fabulous. Thanks so much for the representation that you have given us." "Thank you so much for the oil candle, it was great. I love it." "I made a mistake. I wanted to look at Rendez-Vous art gallery from Vancouver and first, I saw your art gallery. Ah! What a surprise! You have very nice paintings and art gifts. My eyes are enjoying. Thank you." "The other two (Brumbaugh) paintings I purchased look so fabulous over the mantel, and I'm getting some grasses placed in square glass containers with river rocks to go on the mantel itself, which works really well under the artwork. Thanks for staying in touch ... and I look forward to seeing more art in the near future." "Just a quick note to let you know that the vase arrived a little while ago and is in perfect shape. It is a really nice piece and I am glad we had the opportunity to work with you on acquiring it. Thanks again for such a smooth transaction and wonderfully safe packaging of the great Correia vase." Yay! We're famous! Thanks for including us in your mailing." "Geeze! The web site looks great! We really do appreciate the effort you put into marketing functional art made by American craftsmen and women. Your web site is very functional and easy to navigate. Thanks!" "What brings me back is the relationship I have formed with the gallery owner. I trust her judgment and enjoy her non-pressuring style, the information she shares about the pieces and her willingness to do whatever it takes to make me feel comfortable with either a buy or don't-buy decision. We have also shared a few personal anecdotes which makes things fun. It's like shopping in a boutique where you have known the owner for awhile and trust her, as opposed to shopping in a huge department store where you receive little attention and everyone works on commission. Finally, one has the impression that the owner (Karen Burton) has chosen her artists carefully and selects unusual and unique pieces to put on the web site. One doesn't have to dig through a lot of cheaper work that you can find anywhere. Rendezvous Gallery has truly lovely pieces. "Your new web site is beautiful. It is well designed and easy to use. Congratulations!" "I love the article written about Amy Kahn Russell. I like this trunk show best so far—the bright green stone would go great with a new top I have; the citrine and freshwater pearl earrings are great and the carved smokey topaz is so elegant looking." "WOW!!! Looks great!!!! You guys rock!" "The earrings were all great. The coral pair arrived very timely. Keep me on your mailing list." "The web site looks great ... best of luck." "Many thanks. I was delighted to find you!" Shop online through May 15! I just looked at your link to the new additions to Amy Kahn Russell's trunk show - WOW, do I ever need to win the lottery! Her pieces are stunning. I am a huge fan of her work and really love the pieces I have from her. Her work has so much heart and soul, such a lovely lady!